In bubble column bioreactors, the hydrodynamic behavior like mixing time, bubble size and morphology of filamentous fungi are influenced by the construction of spargers. Sparger pore size is an important factor influencing formation of bubbles. 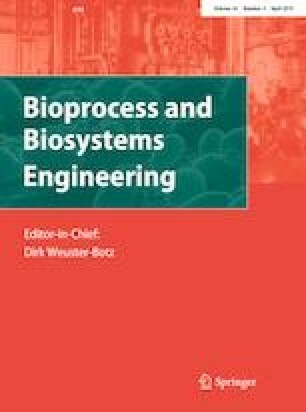 In this study for the first time, a 5-L bubble column bioreactor with different porous spargers was used to investigate the effect of mean air bubble diameter (at 0.36, 0.18 and 0.09 cm) on fungal growth, broth viscosity, fungal pellet morphology and lovastatin production by the filamentous fungus Aspergillus terreus. All cultivations were carried out at air flow rate equal to 0.5 Lair L−1 min−1. The viscosity of the broth was influenced by both biomass concentration and size of the fungal pellets. The highest values of viscosity were observed at bubbles of 0.09 cm diameter after 192 h of cultivation. The largest fluffy pellets and the highest yield of lovastatin (443 mg/L) were obtained at air bubbles diameter of 0.18 cm. Lovastatin yield on biomass growth in this condition was, respectively, 1.7-fold and 3.5-fold higher than in the cultivations performed with air bubbles of 0.36 and 0.09 cm diameters. These laboratory scale experiment indicates that air bubble diameter has the impact on lovastatin production and A. terreus culture conditions. The online version of this article ( https://doi.org/10.1007/s00449-019-02118-5) contains supplementary material, which is available to authorized users. The authors would like to thank the staff of life science engineering laboratory for their assistance.